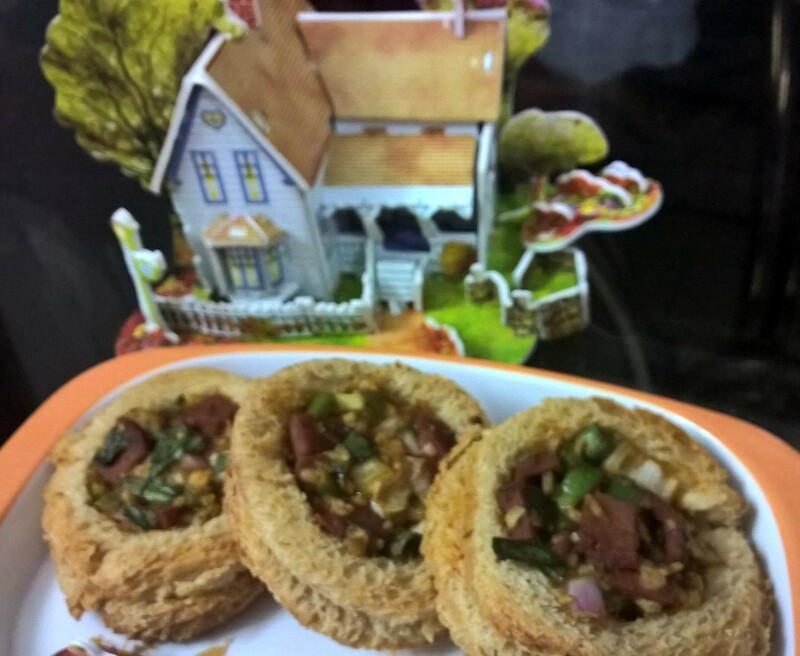 A delicious , quick & easy to make homemade baked non veg snack. Add some soft butter 1 tbsp, tomato ketchup 1 tsp ,sandwich masala powder ½ tsp and some grated cheese 1tbsp in a small bowl and mix them well. Add some finely chopped chicken salami, finely chopped onions, finely chopped capsicum , grated cheese, coriander leaves, pepper powder, dry oregano powder,1 tsp. tomato ketchup ,ginger garlic paste ,sandwich masala powder,sprong onions and salt to taste and mix all in a bowl. Take some white bread slices and cut them with a round cutter. Cut smaller rings out of the bread slices so that each bread slice can be used as a base with a ring on top. Finely spread the butter spread on the bread slices properly. In the centre of the ring, add the chicken filling till the level of the bread. Bake in a pre heated oven at 180 degrees for about 5-7 minutes, until the rings are golden-brown in colour. Want to make these RECIPES afresh?